Nearly forty U.S. states now require continuing education for engineers to maintain licensure. And, several others have new regulations pending that will take effect soon. Use the links below to check your state’s PDH requirements. Six state boards pre-approve continuing education providers. PDHengineer.com is an approved provider in all of these states. Click thumbnail to view approval letter. Other than the states listed above, none of the state boards have a program in place to pre-approve specific course providers or specific courses. PDHengineer.com courses have been accepted for PDH credit by all the state boards that don’t pre-approve course providers. However, it is ultimately the engineer’s responsibility in these states to determine whether an activity meets the guidelines set forth by the state board. Correspondence, distance learning, and internet courses are accepted by all the states that require continuing education activities provided that the course meets the Board’s requirements and provided that completion of the course can be independently verified. The state boards consider completion of a course to be independently verified if you must take and pass a quiz to successfully complete the course, if the quiz is graded, and if the results are kept on file by the course provider for a prescribed length of time (the number of years varies for each state). 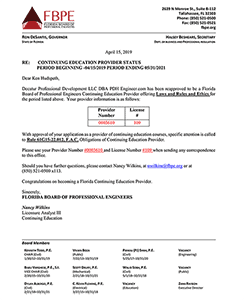 It is generally the engineer’s responsibility to maintain records of continuing education activities and to submit the records to the board upon request. As stated above, online courses are accepted for credit if completion of the course can be independently verified, which requires that the course provider maintain a record of successful course completion for a prescribed length of time. In addition to issuing a certificate of completion when you pass the course quiz, PDHengineer.com maintains a record of your successful course completion at our company’s headquarters for 7 years, which meets or exceeds the requirements of all states that mandate continuing education for engineers. To start earning PDHs now, browse our course library. Looking for more information? Learn about the PDHengineer Triple Guarantee.